Compost is the gardener’s best friend. When you make it yourself, you end up with a free soil supplement that gives plants nutrients in a form they are best able to utilize so you have stronger, healthier plants that slowly and regularly take up nutrients. At the same time when you make your own compost, you are keeping those kitchen scraps and garden trimmings out of landfills. Using compost means you don’t have to buy commercial fertilizers — a win-win for you, your plants and the environment. It just makes sense. But mention making compost and some blanch at the idea. They worry it will smell bad. They worry it won’t work (Not to worry, making compost is not rocket science.) and they might worry about having a place to locate a compost pile or bins. That’s why the barrel-like compost tumblers have their appeal. Not long ago I spotted an ingenious “home-made” compost tumbler from a plastic 50-gallon barrel at the local welding shop. The owner explained he was making the device for a relative, and seeing the clever interpretation of those pricey compost tumblers, I suggested he consider selling kits of the welded hardware to gardeners who could make their own. While his proto-type isn’t complete, needing some sort of stand or support on which the barrel can be turned, I snapped a photo to share with you. Anyone with welding skills or ingenuity might be able to take the idea and run with it. Whether you make or buy a tumbler or fashion compost bins or just start accumulating ingredients in a compost pile out back, the time to start has never been better. The last question you might ask: Is making compost work? Yup it is. But then so is gardening in general, and the satisfaction of keeping a lot of organic wastes out of landfills and creating one’s own soil supplements that make for healthier plants and a healthier environment is well worth the effort. So, what are you waiting for? Mention lavender and one of the first things that comes to mind might be an English garden. While the British do indeed have a fondness for lavender, this aromatic herb grows best not in a cool and damp climate, but in a warm and dry one. Think Mediterranean (or Provence in France) and you’ve got the idea. So Florida’s hot and humid climate isn’t the first choice for growing lavender. 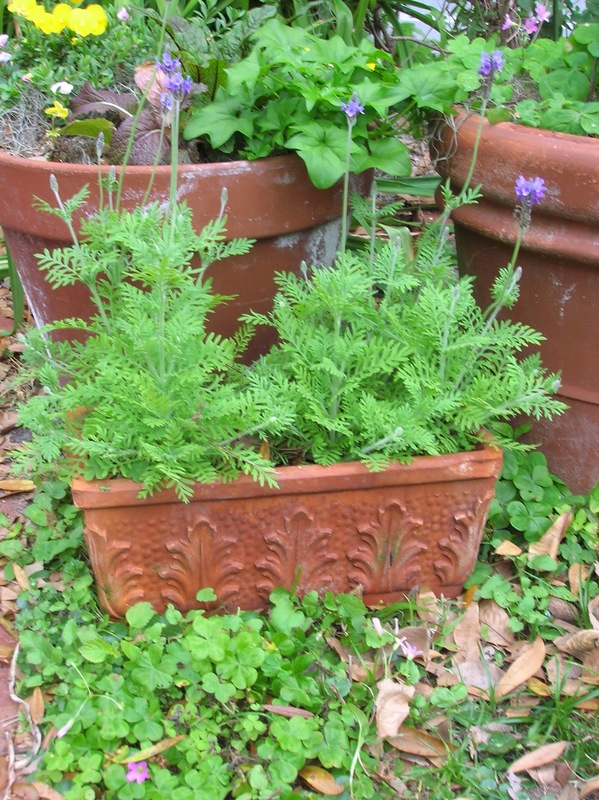 However, there are some lavender varieties that can be successfully grown in the Sunshine State. French lavender and even some of the Spanish lavender varieties might work in your area, and an even better choice is fern leaf lavender. Though not quite as aromatic as other varieties, fern leaf has beautiful blooms and delicate, silvery-green foliage. It is easy to grow this perennial herb from seed if you are not able to find seedling plants. (Renee’s Garden Seeds: reneesgarden.com has seeds). Start with a good-quality seed starting mix and plant lavender seeds according to seed packet instructions, covering seeds lightly. Like all lavenders, fern leaf prefers an alkaline soil. When plants are three to five inches tall, cover soil around plants with crushed shell (or crushed egg shells), mixing some into planting medium when planting, situating plants in full sun and provide good drainage. Okay, I’ll be the first to admit it isn’t pretty. But so far…yes so far…it has kept the rascally squirrels out of the bird feeder and hasn’t been expensive nor did any squirrels get hurt in the process. We’ve tried pretty much every solution known to mankind to keep the squirrels out of the bird seed. And because IT IS THEIR JOB to get to said seed, the squirrels have proved themselves to be infinitely resourceful. But no more. And though I am hesitant to be premature on this claim, I think — really think — we may have outsmarted the squirrels on this one. I think that at long last we may have scored one against our little bushy-tailed adversaries. You see the squirrels can easily climb up the smooth five-foot metal pole upon which the bird feeder is mounted. I’ve tried smearing the pole with grease and grease (pr petroleum jelly) with hot pepper flakes mixed in and that does work, but only for a time or two. In fact it is quite entertaining to watch them try to climb up as they slide back down. But those dogged little rodents keep at it until they wear away the lubricant. So, it was back to square one. The solution is hardly our own invention. We’ve been hearing about buckets and big plastic bells being applied to bird feeders at various places. In this case we mounted a length of stovepipe with four small holes punched evenly around the edge at one end. We used short pieces of wire to fasten the pipe right up underneath the wire mesh floor of the feeder. 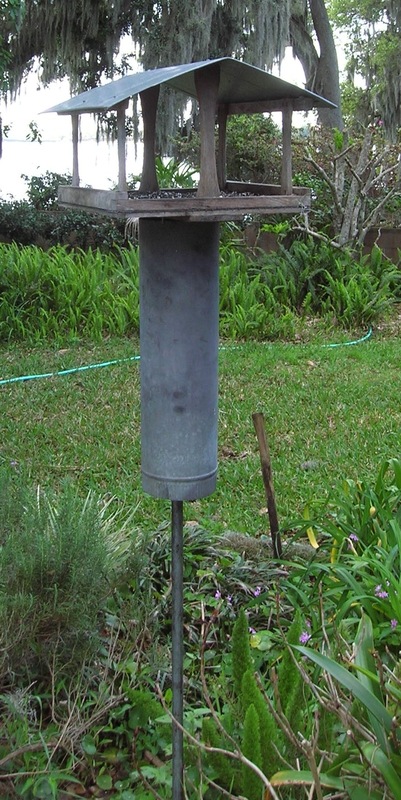 The critters can still climb up the pole, and do so right into the pipe, but then they are stymied once they reach the deadend of the top of the pipe at the bottom of the bird feeder tray. Rats! So close yet so far! They can’t seem to make that progression from the skinny pole out to the pipe which is only about five inches in diameter. It’s as if they can’t grasp something that smooth that is just a bit too wide for their little “arms” to surround. Plus the open hole at the bottom might just confuse them and it certainly does make it difficult to get a grasp on the stove pipe. But however it works doesn’t matter. What does matter is that it seems to be working! Looking for something in seeds that is unique, something unusual or something with a history? All that an more can be found in the new Southern Exposure Seed Exchange catalog. My order just arrived and in it were two varieties of ornamental gourds as well as Nankeen cotton. That’s right — I’m gonna’ try growing cotton. Talk about an heirloom crop! These unique varieties and many more that are perfect for Southern gardens are among the many and varied selections from Southern Exposure Seed Exchange. Whether you are looking for beans, greens, peas or cucumbers or tomatoes or herbs or just about any vegetable (and there are flowers too) that are Southern favorites, you are likely to find it for both hot and cold-weather gardens. You’ll find early Mizuna and Tatsoi greens as well as the highly ornamental and flavorful Red Giant mustard — all choices that aren’t offered everywhere — as well as those unique items like several varieties of cotton or ornamental gourds . For more information, and to request your catalog or shop on-line, visit the website at: http://www.SouthernExposure.com. The Meyer lemons and the key limes are gone, their season over. But the pretty pink lemons with green striped skins which grow on handsome little trees with variegated foliage are coming into their own. Such bounty. The rest of the citrus trees are blooming, all but the Chinese honey trees which are usually the latest to blossom out. Made my very first batch of marmalade from calamondins today. 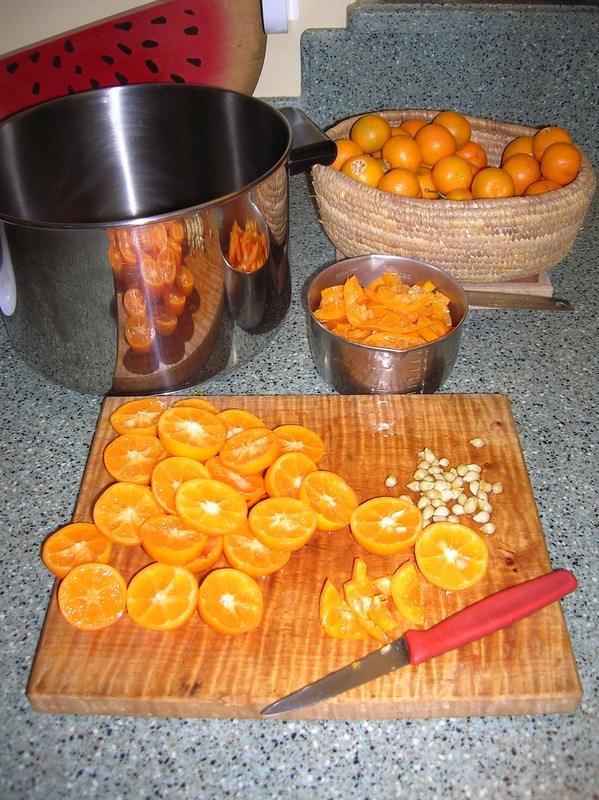 For years I’ve been making marmalade using honey bell tangelos or sometimes Hamlins, but my favorite orange for marmalade has always been Valencias. However I think I may have found a new marmalade citrus — the little calamondin. Until now we only used the cute little oranges for what we called “garnish fruit.” The clusters of bright orange mini-oranges were great for adding just the right touch of color to all sorts of meal presentations. But lately I kept hearing about how “great” calamondin marmalade was, so I just had to try it for myself. To my surprise it was actually easier to make than the kind using full-size oranges, even though those tiny fruits are about five to 10 percent seed. Yes, the seeding of the calamondins is a bit tedious, because there are so many and such little seeds. But all-in-all the preparation was a lot less work. Anyone who has ever made marmalade knows how labor-intensive it is, even when using a box of that powdered fruit pectin. I searched the Internet for a recipe, expecting to find one using powdered pectin, but of all those I found, none called for it. So it was with a bit of reserve that I went out and gathered the little fruits to make a batch. I found that if I cut the fruits in half and removed the seeds, and then sliced each half thinly that the prep work went quite quickly. The fruit has to be mixed with a bit of water, cooked and then refrigerated overnight. The following day the sugar is added and the marmalade is cooked. And you know what? Everyone was right! It is the best marmalade ever. I may never go back to the big oranges again. Calamondin marmalade is different from marmalade made of oranges, a bit muskier in flavor. But that’s what makes it so distinctive. If you are lucky enough to have a ready supply of calamondins (some people even grow this type citrus in the far north because the trees are smaller than other citrus trees) give it a try. You won’t be disappointed. Seed and thinly slice the calamondins. Measure fruit and mix with 3/4 cup of water for each cup of sliced calamondins in large kettle. Bring to a boil and boil 15 minutes over medium-high heat, stirring occasionally. Cool and refrigerate overnight. The next day, measure cooked fruit, adding a cup of sugar for each cup of cooked fruit. Bring mixture to a boil, stirring frequently, and continue boiling vigorously until the mixture reaches 220 degrees on a candy thermometer. Remove kettle from heat. Ladle marmalade into clean, sterilized, hot jars and seal. Store in refrigerator. Makes about six jars.